Presence of iodine is vital to hermatypic invertebrates because it is used to detoxify excess oxygen produced by zooxanthellae. This oxygen irritates sensitive tissue. Corals and clams that appear to shrivel or close under intense lighting are likely attempting to shade their zooxanthellae symbionts to reduce the rate of oxygen production. 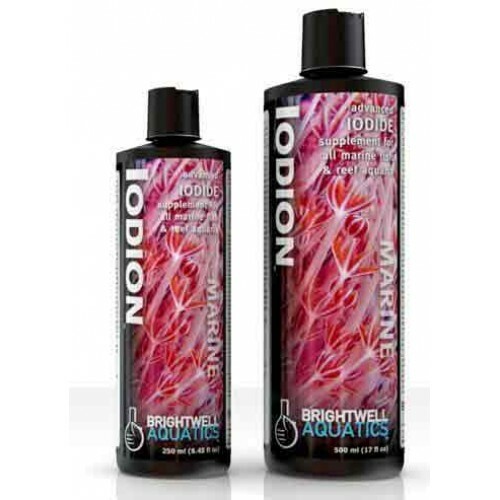 Iodide essentially bonds with oxygen to form non-toxic iodate, relieving the need to shield zooxanthellae and enabling the host organism to open more fully. The predominant form of iodine in seawater is iodide. The natural seawater concentration of all iodine species combined is approximately 0.06 ppm, classifying it as a minor element. Even in this small concentration, iodine is required for survival of fishes, crustaceans, macroalgae and kelp, and hermatypic invertebrates alike. The importance of iodine in a reef aquarium cannot be overstated. Iodine binds rapidly with latent organic material and is passively removed by aggressive protein skimming and the use of organic-adsorption products such as activated carbon and specialty resins. The combined biological and chemical depletion of iodine necessitate that its concentration be monitored and the aquarium supplemented as needed. The rate at which iodine is extracted from the water is determined by the stocking density of reef-building livestock, type of lighting, and other biological, physical, and chemical conditions. Once the rate of iodine uptake in the aquarium has been determined, the proper dosing rate of this product can be easily calculated. Basic: Shake product well before using. Add 5 ml (1 capful) of product per 50 US-gallons of aquarium water every two- to three-days or as needed to maintain the iodine concentration within a range of 0.04 - 0.06 ppm. When used in this fashion, 250 ml treats up to 2,500 US-gallons (9,464 L).